Firstly, the competition bit – although this is less interesting than the giveaway further down). You get a competition entry with each £20 purchase of train tickets this month. (You can also enter by spending 200 loyalty points, but this is a terrible use of points). All customers that transact (purchase a train ticket) within the promotional period will receive 100 redspottedhanky.com loyalty points to be redeemed against the cost of future train travel or rewards via the redspottedhanky.com rewards portal. Customers will receive 100 redspottedhanky.com loyalty points every time they transact within the promotional period regardless of ticket price. redspottedhanky.com loyalty points will be allocated to all transacting customers redspottedhanky.com loyalty accounts within 28 days of the closing date of the Promotion. Loyalty points are personal to the account holder and the allied loyalty scheme account to which they have been allocated. They cannot be transferred to any person or account, nor can they be sold or traded in any way. 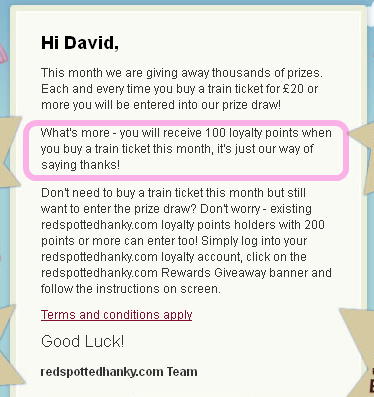 Loyalty points may only be redeemed against future train travel with redspottedhanky.com or items listed on the redspottedhanky.com rewards portal. So, on a purchase of cheap £4-5 tickets, if you make those in your week/weekend, you are getting the equivalent about 20-25% cashback. Even at £10 you are getting 10% back. 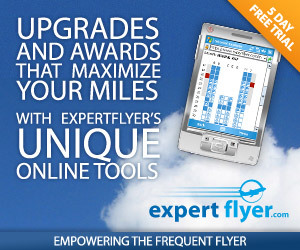 Sadly the points will not be awarded for 28 days, so not possible to check. But I will certainly be forgoing pitiful other cashback routes for my ticket purchases in May. I’ve just had an email saying I’ll be getting 100 loyalty points shortly for this promotion. Only bought the one ticket with them during the period though, so I was only entitled to 100, maybe someone else can confirm if multiple purchases got the multiple bonuses as per the T&C? Nick, I have to say that myself I only did 1 qualifying purchase per RSH account across family members during the period – I had no reason for limiting it to 1, other than only needing a few tickets that month. It would be good to know if anyone did receive multiple for future reference.